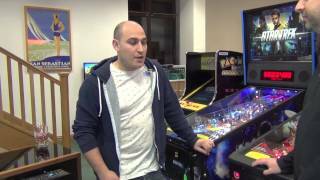 Craig Pullen, UK Pinball Champion, explains how to maximise multiball play. This is the key to scoring big points, so make sure you try to control the balls as much as possible, despite the mayhem! Craig Pullen: Okay. 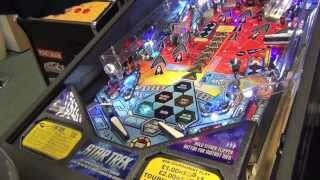 So the next thing that we're going to talk about, which is a really important thing in pinball as well is multiball. 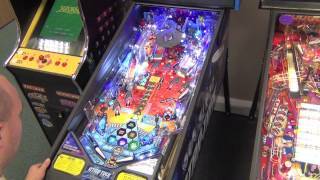 For a lot of machines the main objective, if you like, is to get to achieve multi-ball. 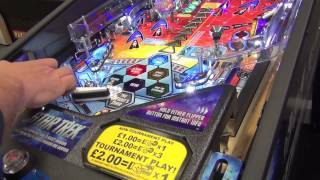 But when you're there, a lot of people they just spend their time just flipping the ball away and then the multiball is over within 15 seconds. 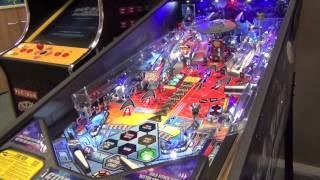 And there's a number of skills that we can learn in order to keep multiball going for a bit longer. 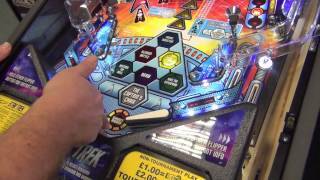 So I'm going to just get us into multi-ball by cheating the machine and then I'll try to demonstrate how that works. Okay so. That's ball two locked. And then if we go down the middle. 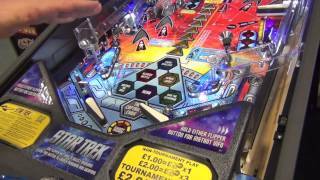 Start multiball. 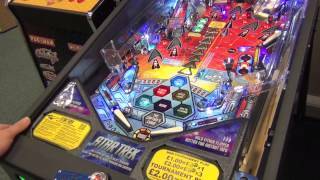 So, what I'm trying to achieve in multiball is to get the ball back under control. The ideal situation is having two balls on one flipper. And if we can, that ball is coming back because the force saves the ball, and then having the other one on the other flipper. Whenever there's a multi-ball my objective, because the way that I play, is to try and keep the ball back into control. 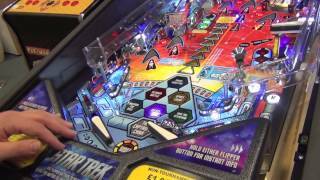 We'll just work our way back into another multiball now. Okay? I'll just try and demonstrate that a bit better. Rather than talking I'll just try and play and see if I can actually keep the ball going. Okay. So, this is my perfect situation. So from this position I am keeping that right flipper up and what I want to try and do is continually hit that left ramp. It kicked another ball into play. So, what do I do? I don't even want to play with two at the minute. So I am just going to, again. So now that situation is the right ramp is the one that is lit. I'm going to try to hit that right ramp with this flipper. Okay. It was too early. Again I so have gotten rid of that ball because I just want to trap one and play with the other one. So I have gotten that one back under a trap. Okay. So now we are going to try some cradle separation. If we can. Too high. Be patient. Not quite enough. Too much. Not enough yet. There we go, that is perfect. And then the ball goes over and then we are playing with the one again. All that time, though, all I was trying to do was get that ball separated. 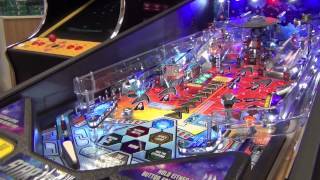 The pinball is massively about patience. You have got to be patient. You have got to bide your time. Too much. Too much again. Okay. We might be able to do it here. Okay. Another skill that you can do is when you flip that ball up here, with this ball, is fllip that ball away and then catch the ball again. So that is called an over/under. So we will try that one. Okay, we will flip that ball away and I will call back. So again I am in a position where I am trying to get that two ball. So let's try again. Okay, that was a nice little pass there. Let's try to get that ball separated. All I am trying to do then is to just play with this one ball. So if I take my shots. All that time the ball is under control. Live catch or busted. Okay. 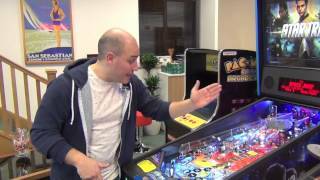 So as we can see there is a couple different skills in multiball in terms of how we do that. Now some people, they just like flipping all of the balls. And sometimes you can score a massive score if you're accurate of just continually shooting all the balls up and down. If you are able to continually control the ball and if you have always got one on your flipper then it is like insurance, isn't it? It's like you're playing with that one and you are never going to lose the end of you ball because ultimately it is like playing on space invaders or something. You have got a certain number of lives. 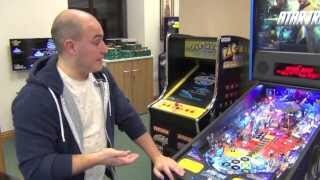 And in pinball, you have got three balls, and that's your life. So you want to protect that as much as you possibly can. So the more time you spend with that ball trapped there's no chance you are going to die. It is not going to be the end of your ball. 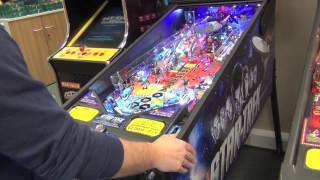 So, for me, it makes sense to trap up with the one ball and play the multiball out with the other balls if you can with the other flippers. When I play a proper game in a bit hopefully you will see a bit of that. 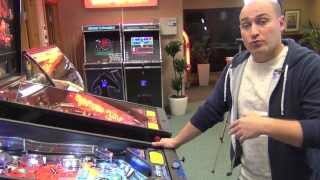 Narrator: So for more pinball videos with Craig Pullen please visit homeleisuredirect.com/pinball.